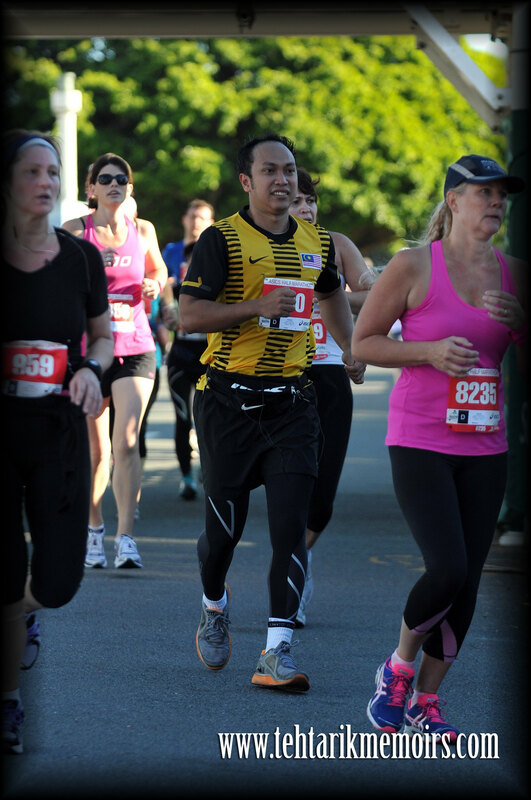 It was going to be the first time I am running outside of Malaysia! 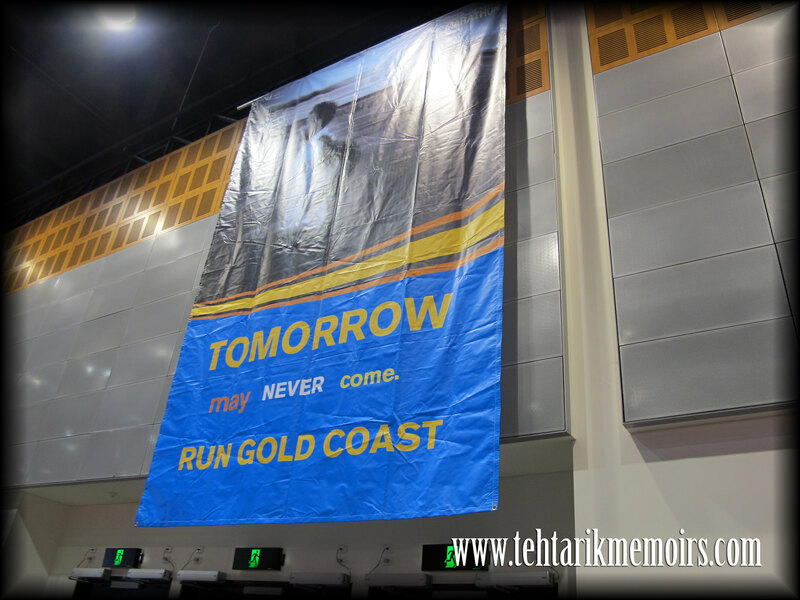 Upon our arrival in Gold Coast, we had to rush immediately to the exhibition area to pick up our kits, still tired from our journey. Still when we got there, countless numbers of booths were there for us to look around! 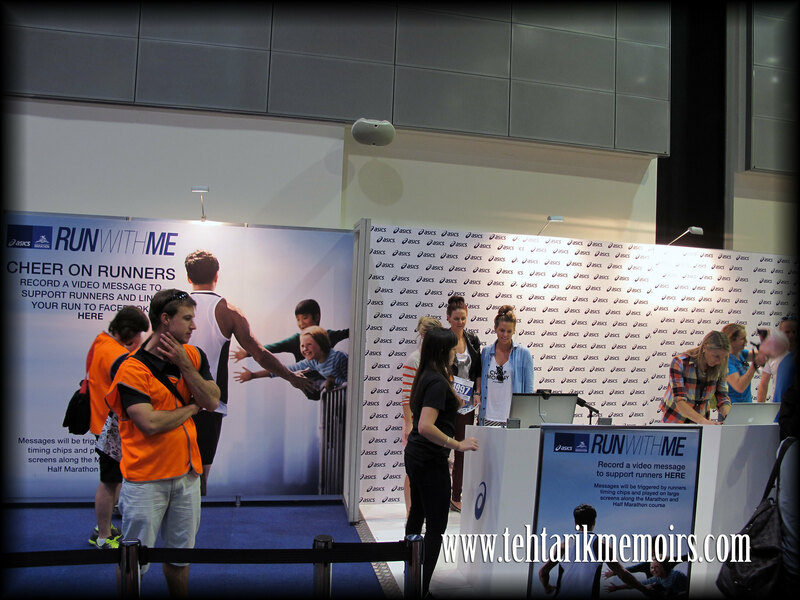 While we were walking around the area to look what was offered, I got myself some of the merchandise and even saw some promotions of other marathons in Japan, New Zealand and even in Europe which was so intriguing to check out. However my main aim there was to get some GU Gels which was selling oh so cheaply in comparison to the shops in Malaysia. Good choice to buy it here. Nevertheless we called it a night early to rest for the early morning flag off. Still I had a backup plan. 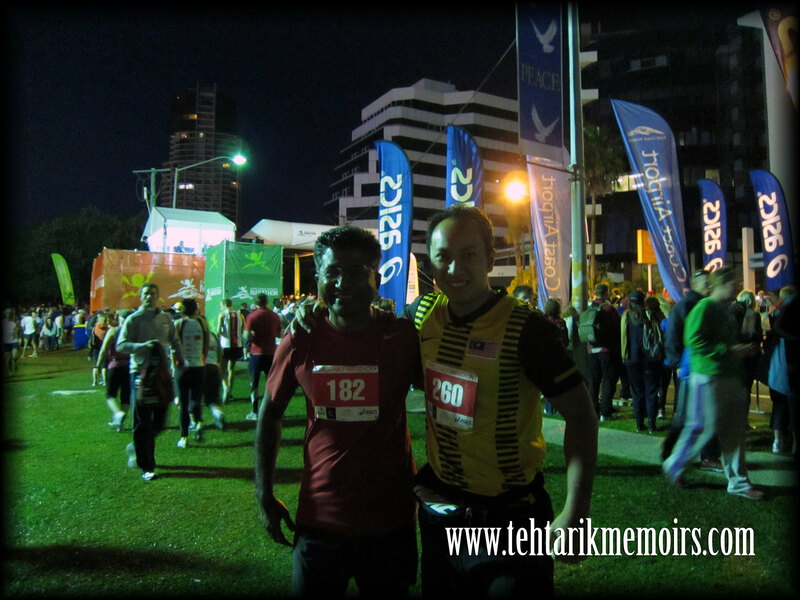 I was going to run with the Malaysian jersey. All pride and passion of it! Once we were out we had two problems. Firstly, our supposed chartered buses refused to stop in the bus stop in front of the hotel, much to our dismay and at least 50 more people waiting in line with us. Second, it was 7 degrees that morning and boy was it windy. Realizing we were going to be late, we begged a group taking a taxi from another hotel to share with us and raced to the starting line. Dashed to the starting line, agreed on a meeting point for us later after the race, kissed my good luck lady, warmed up and we were good to go! At Kilometer 1, it was freezing and I was feeling the heavy brunt of it. So many people were still in their jackets but I didn't pay much attention to it. 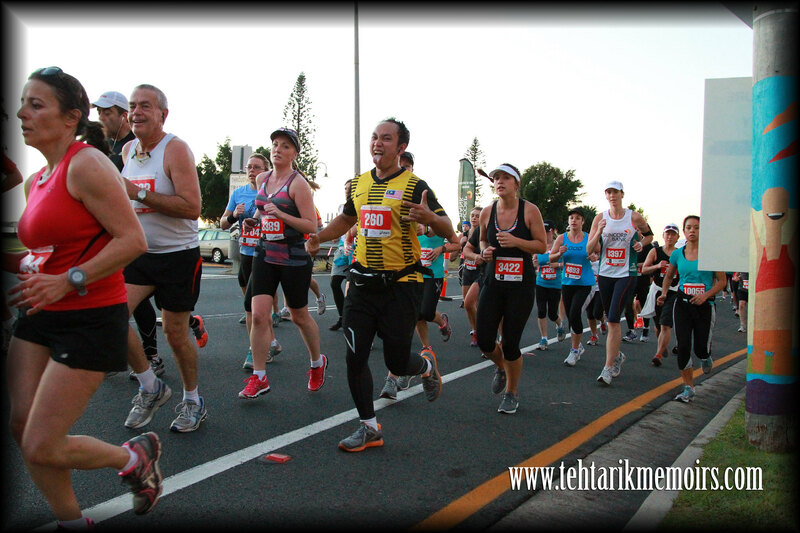 Kilometer 10, I was making good pace and so far, the support team has been nothing short but excellent. Ample watering stations with mixes of isotonic in it as well as medical team units always on the prowl in case of some mishap. It was here I took my first bite on the GU gels. Kilometer 13, people started to slow down and so did I. I lost track of the 2 hour pacers and right now I am trying my level best not to get overtaken by the 2:30 pacers. Kilometer 17, I could see the kilometer marker from the road signboard and I knew I was close. By this point I was running on pure mental strength of managing fatigue and the cold at the same time. 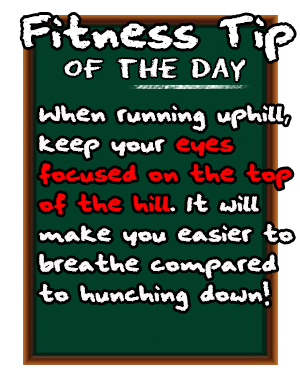 A few awesome runners saw me slowing down and started to motivate me to keep going. That was when I did. Kilometer 19 was the last watering station and I could smell the finish line from here. By this point the calve cramps was in full glory but I wouldn't give in. I knew I was in time to hit my mark time and I couldn't let it slip. 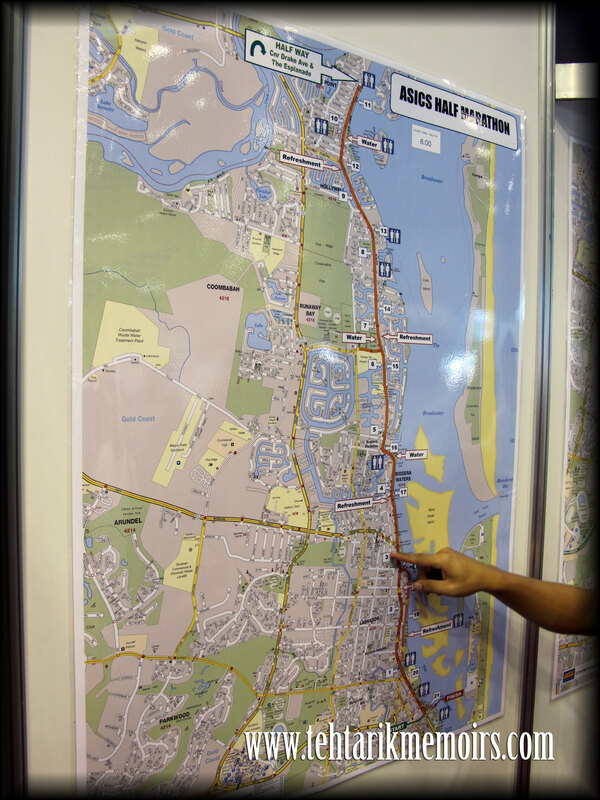 It was here that I saw a few Malaysia screaming at me to keep going and I just had to acknowledge them. 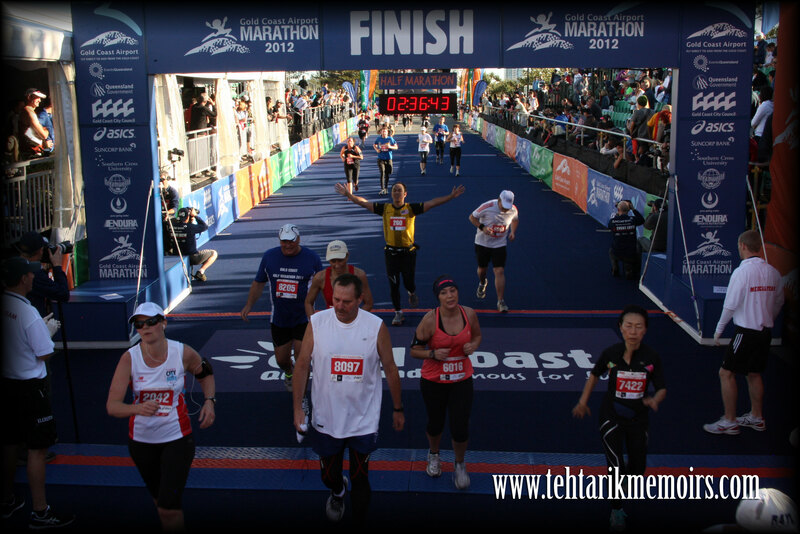 At the last stretch, I saw a huge gate thinking it was the finishing line only to realize it says " Congratulations. 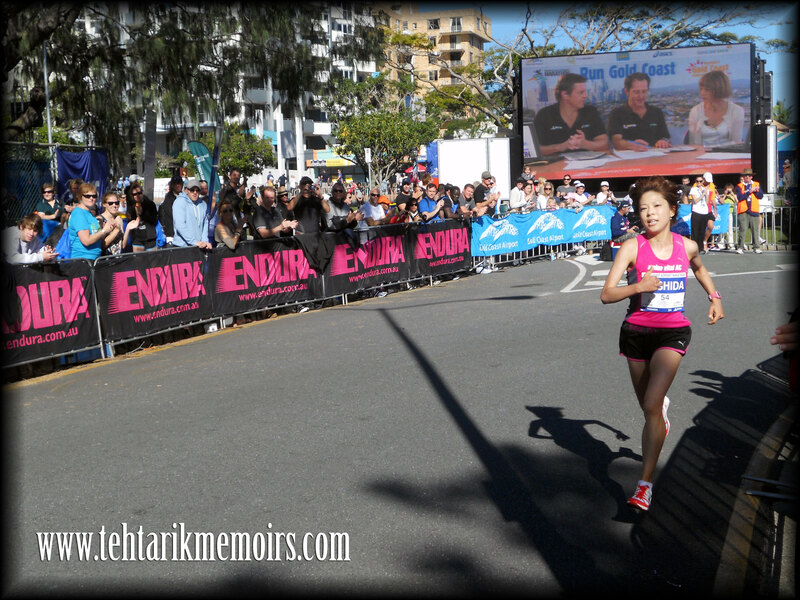 270m to the finish line". I was cursing at being faked like that but kept running. One last turn and there it was. 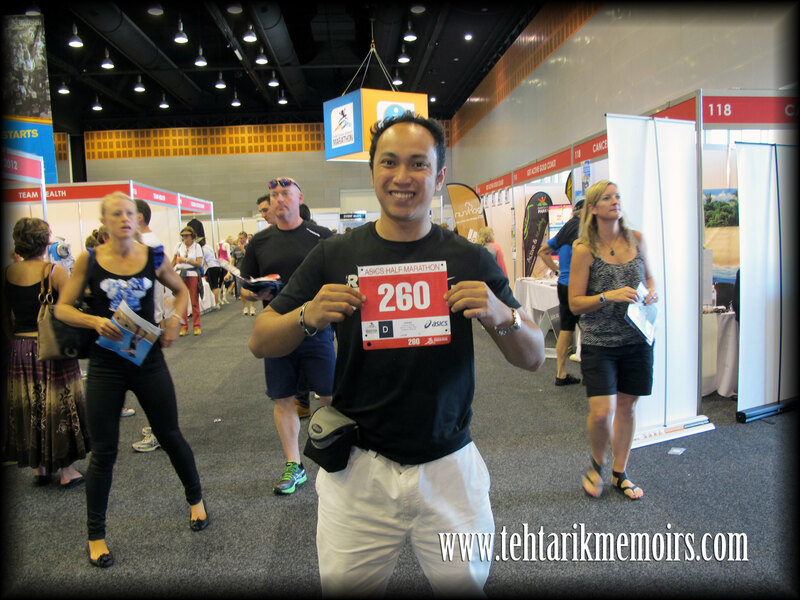 As I faced the finishing line about 50 meters ahead of me, everything started to overwhelm me. 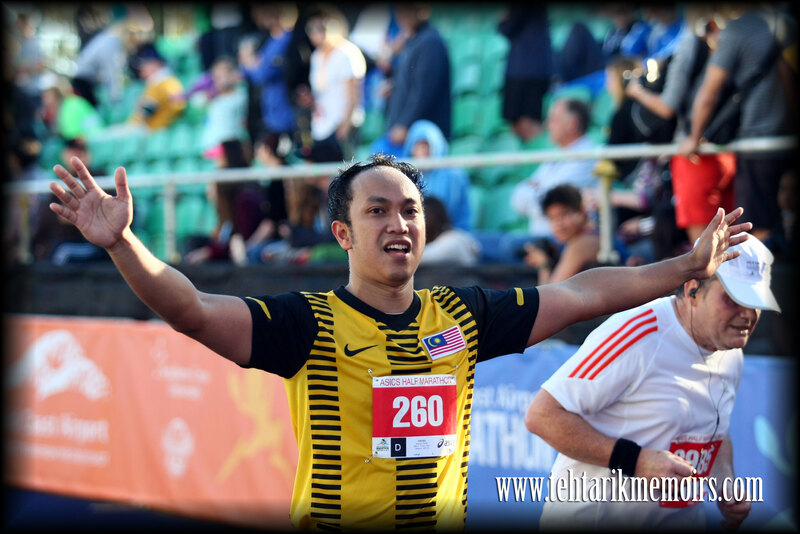 All the people cheering me on during the race, the friends and family online that was spurring me to get it done, all the training and hard work I put into and most importantly, I was running proud as a Malaysian. And this was this icing of the cake. 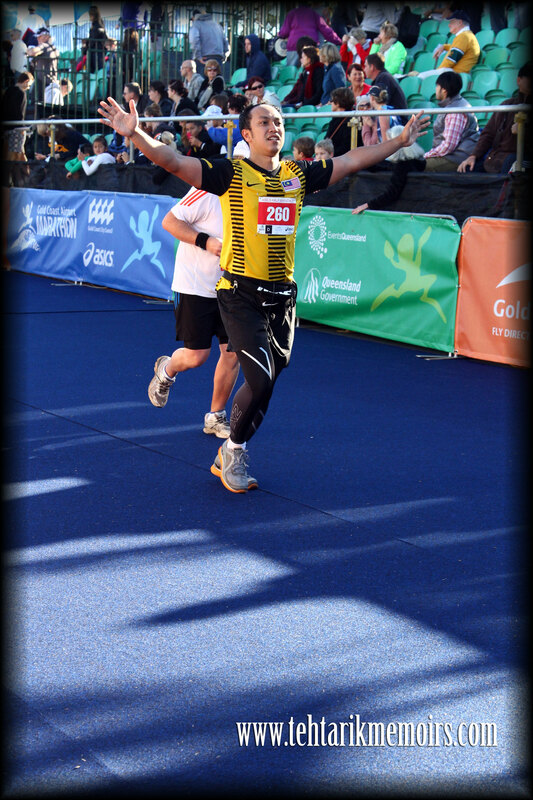 As I was crossing the finishing line, the announcers noticed me and mentioned my name and country while I was crossing. All caught in this little video presentation! 2:32:35! 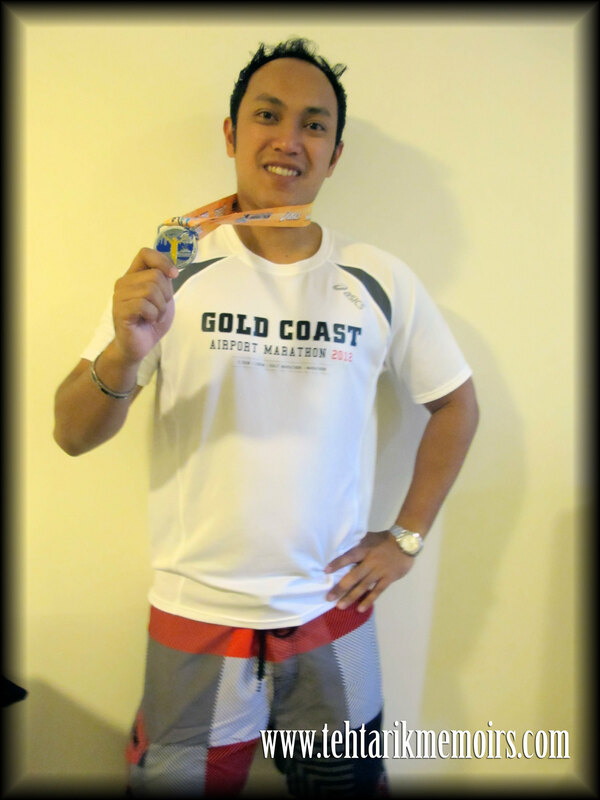 Personal Best for half marathon! Except we couldn't because we lost our camera there! Somehow we accidently dropped our camera somewhere in the fair ground. We went around looking and ended up reporting the lost camera to the organizers. Here is where it got superbly awesome to the organizers. Less that 2 hours after we reported the camera missing, we got a call saying that they found the camera and they are keeping it safe for us to pick up at our own leisure time. As I said, the effort and coordination of the organizers that day was nothing short of amazing and this is your proof. As mentioned , we did eventually have some additional pictures taken thanks to to Davie and Pam who thankfully brought their camera along for the race! Of course all that was left was for my trademark victory pose. Although I was doing this without the presence of my usual Team TehTarikRunners but still the overwhelming feeling was still there despite going solo for this run! 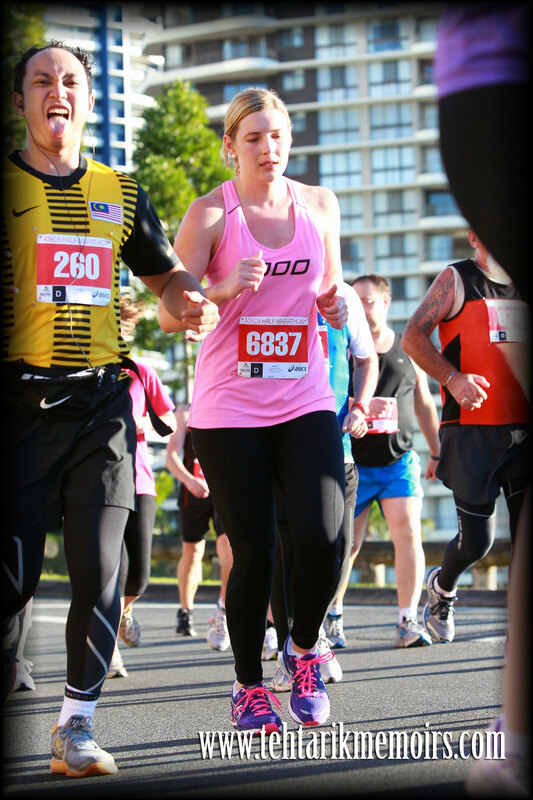 All in all the race has been an amazing experience for me, one that I will cherish for life. 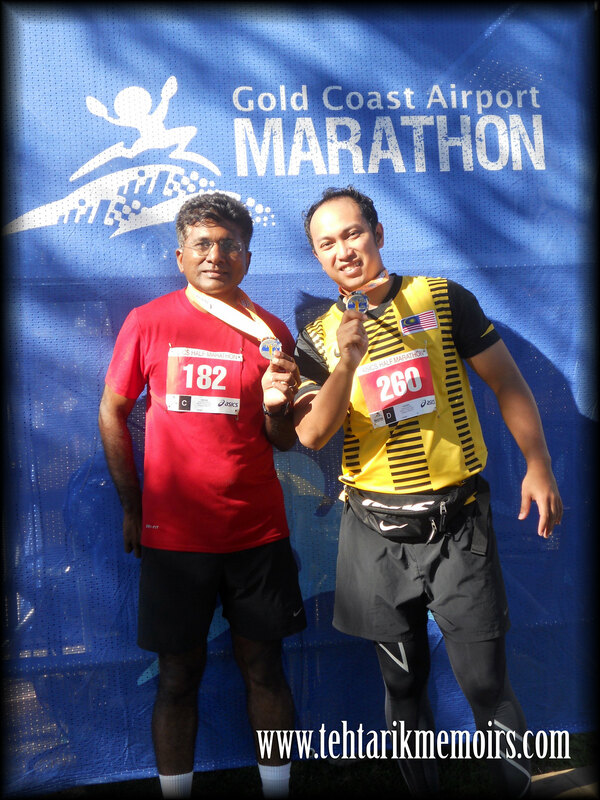 An incredible way to clock in my first half marathon and kudos and props given to the organizers and volunteers of the race who made the entire run not just an event but an experience that people would cherish. 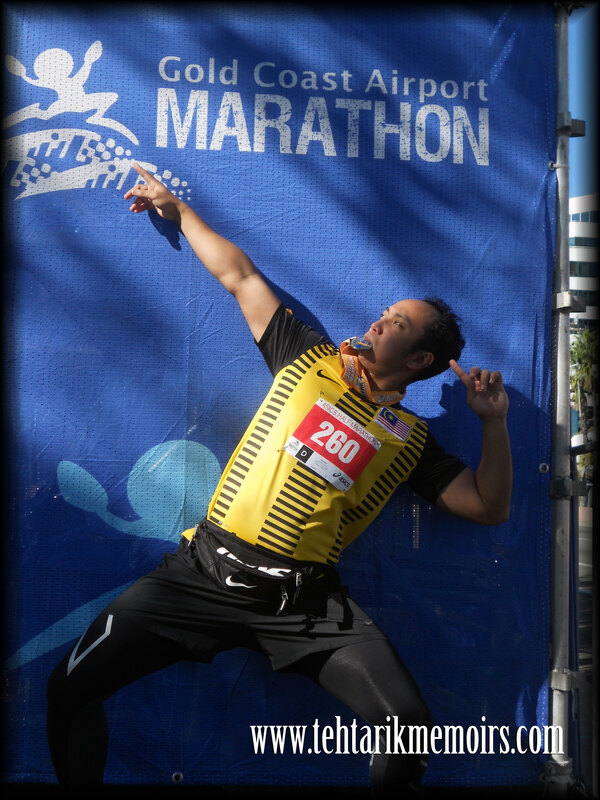 Special mention to the roadside supporters who kept me going especially the one Malaysian guy who screamed "COME ON MALAYSIA" at the last kilometer. 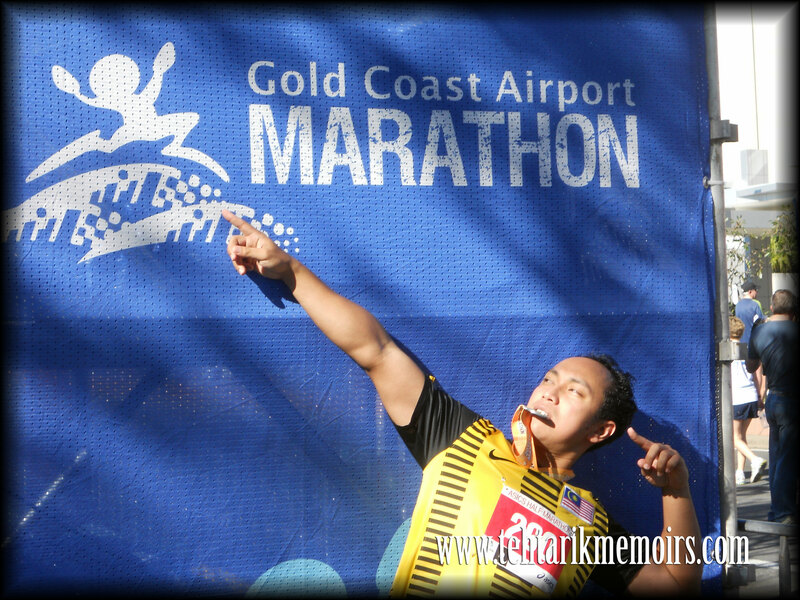 I implore runners out there, go for the Gold Coast Airport Marathon. Honestly best organised race so far! Thank you so much for your sharing ! Please submit your photo for entry ! will do! right now to choose which picture to submit! Geez! You're a runnerrrrrr :D Nice shots! thank you so much and I still regret forgetting to pack in the Malaysian flag! there will be a series of HM after this but I registered my first FM at Singapore Stan Chart this year. Onwards to Ramadhan training! haha thanks so much! wouldnt consider myself a full fledged runner just yet until I run the big 42! Great story well told. Awesome pics you should be very proud. 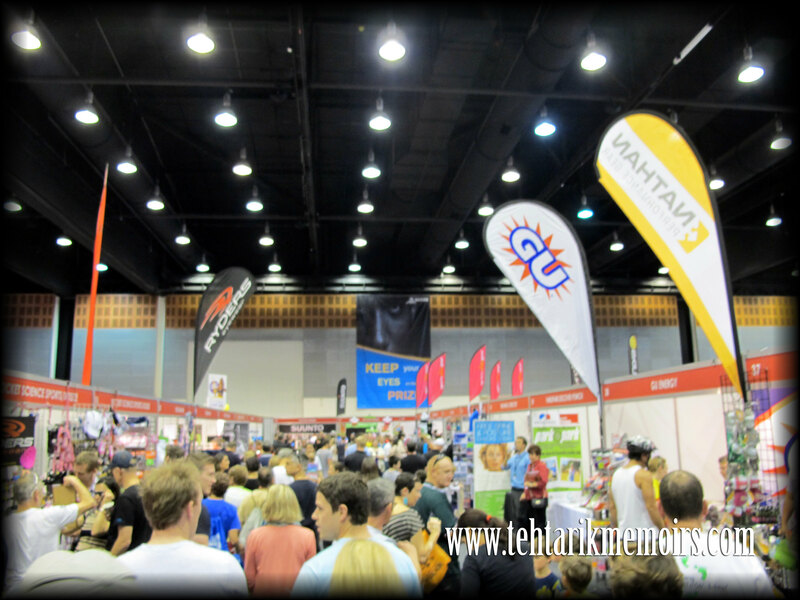 Sounds like you might be hooked on the GC Marathon (I am) and I look forward to next years installment. If you run, you are a runner. Distance is irrelevant. thank you so much! 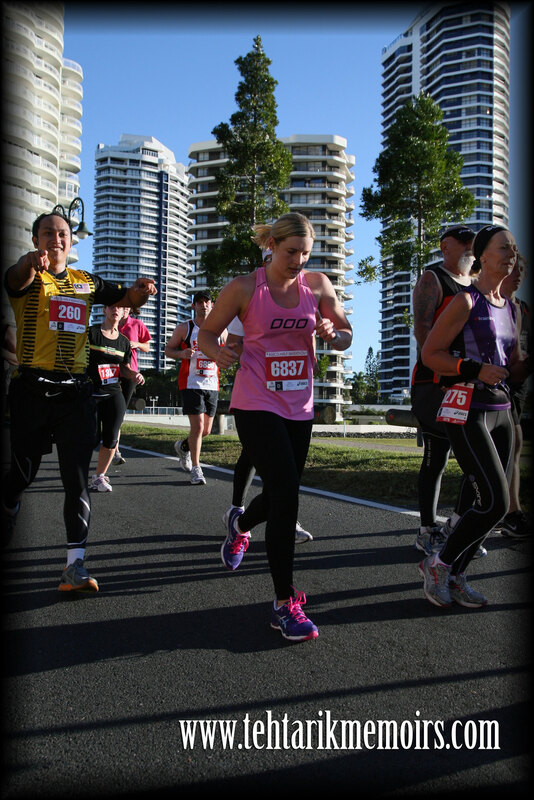 i think at the moment I am getting myself hooked with the runs around the world but GC will the one I'll hold dear to my heart.